Bald Eagle are the largest of the raptors I've photographed. Adult Bald Eagles are very easy to identify by their white head and tail feathers. 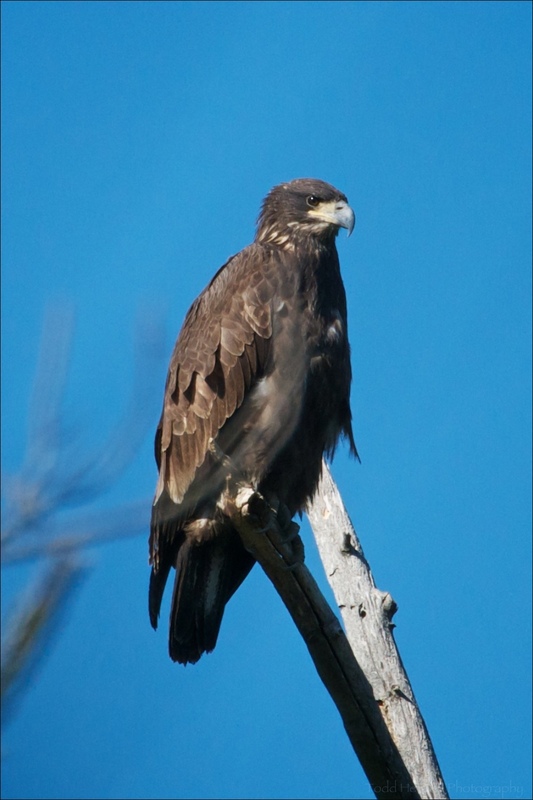 Juvenile Bald Eagles can resemble Golden Eagles, being largely brown. As juveniles age they take on a more mottled look, until they fully grow out their white feathers. I've heard some call Bald Eagles scavengers, stealing food from other birds or behaving like buzzards and eating what they find. I've certainly seen cases of this. However, I've also seen Bald Eagles fishing on their own, and it's a marvelous site. The photo of the Bald Eagle and gulls shows an eagle fishing in the wake of a large ship moving upriver. The eagle is looking for fish stunned or stirred up behind the ship, as are the gulls. I've seen Bald Eagles fishing at the base of a dam doing the same thing. Most of the time I stumble across a Bald Eagle while walking through various parks the eagle sees me just before I see it, and it's gone before I can raise my camera. The photo of the lone Bald Eagle flying was taken when I was standing patiently on the shore watching for anything that happened by. It was late afternoon and the light was beautiful, coming from behind me. I was lucky to notice the Bald Eagle flying upriver early enough to aim the camera and fire off a sequence of shots. It's the closest photos I've made of an eagle, and my best. Notice the mud on the eagles feet and beak. Here is a blog post about my 2015 trip to see the bald eagles at Conowingo Dam in Maryland.